The Symphony in C major "No. 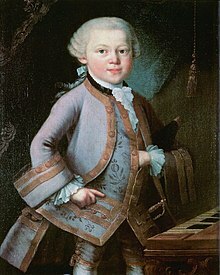 52", K. 208+102, was composed by Wolfgang Amadeus Mozart in 1775. The first two movements are from the opera Il re pastore, K. 208, and the last movement, K. 102/213c, was composed separately. The movements are played one after another without a break. 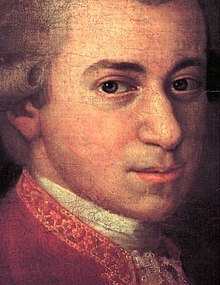 Wolfgang Amadeus Mozart died after a short illness on 5 December 1791, aged 35. His reputation as a composer, already strong during his lifetime, rose rapidly in the years after his death, and he became (as he has remained to this day) one of the most celebrated of all composers. William V, Prince of Orange, painted by Johann Georg Ziesenis. The young prince met the Mozart family in 1765–66. Map showing the Grand Tour, 1763–66. Black line shows outward journey to London, 1763–64. Red line shows homeward journey to Salzburg, 1765–66. Occluded line shows travel in each direction. Leopold, Wolfgang, and Nannerl. Watercolour by Carmontelle, c. 1763–64. The Mozart family's house, No. 9 Getreidegasse, Salzburg, photographed in 1998. The family's quarters were on the floor immediately above the sign "Mozarts Geburtshaus". Violin Sonata No. 27 in G major (K. 379/373a) was composed by Wolfgang Amadeus Mozart in 1781 and first published in the same year. This page was last edited on 17 April 2019, at 06:39 (UTC).